Two of my hives (packed with bees) have currently got two things going on in parallel at their entrances. This picture shows them both; click on the image for more detail. 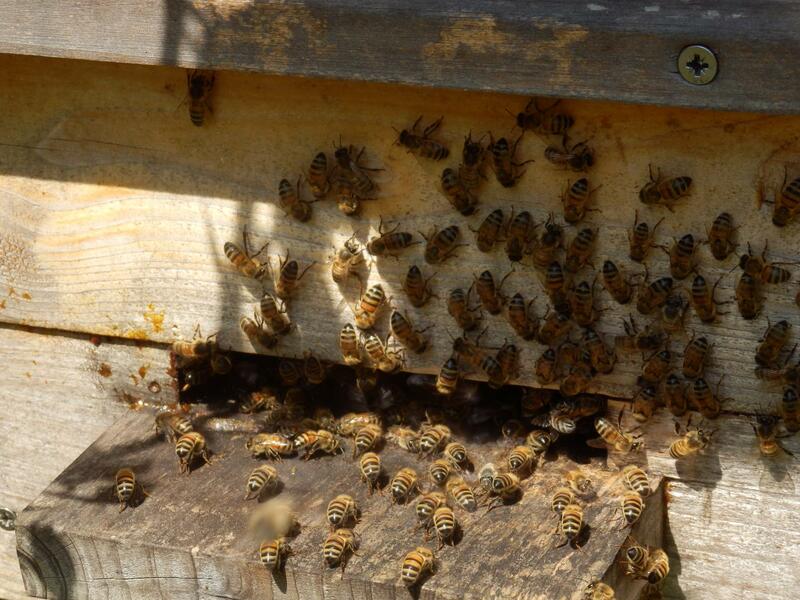 On the horizontal landing board, bees are fanning to cool the hive. Their wings are invisible in the photo. Above them, in the shade of the projecting handle and a plant, are bees apparently using their mouths to clean the hive. You see this sometimes, and it is a sign that a hive is happy and un-stressed. This behaviour is known as washboarding and is characterised by the bees going back and forth over the same area. Often there are many more bees doing this and as they move back and forth you can see they do it in synchronicity, waves of mass movement, like line dancers. I caught this on close-up video a couple of years ago and you can see it here. This entry was posted in Uncategorized and tagged Fanning, washboarding. Bookmark the permalink.